The teams sit one-two on the overall leaderboard, but on Friday, neither team could stay upright. The Kiwis were the first to fall, capsizing late in a close match with Oracle Team USA. The Kiwis came off the foils, crashed down hard, and rolled into a capsize, with some crew members falling off the boat or jumping off the top hull. All crew were safe and accounted for and the Kiwis recovered quickly to start the next race just 15 minutes later. It was in the next race that Oracle Team USA went over. The team was well back of the leaders in the fleet race, and appeared to be surprised by Artemis Racing approaching with rights. As skipper Jimmy Spithill rolled into a quick maneuver to avoid collision, the team didn’t have time to let off one of the lines, pinning the wing sail on the wrong side of the boat, and resulting in a capsize. But as with Emirates Team New Zealand, the American team was able to recover and resume racing. Tom Slingsby, Oracle Team USA Tactician commented: “It was really puffy conditions out there today, two capsizes a few minutes apart after absolutely no capsizes at all in the entire series so far. The conditions made it tough for everyone with gusts up to 15 to 20 knots and sometimes people were getting caught out. However, having said that, the conditions were very raceable, really good if you were sailing well, but if you missed the shifts in the wind they were very frustrating. “With our capsize, it was the last race of the day. We just didn’t see Artemis going upwind. We were lighting up our gybe on the layline and then saw Artemis at the last second. Jimmy [Spithill] did the right thing and turned up to avoid them but unfortunately we capsized. However, we didn’t hit them and we managed not to destroy two boats, so even though it’s frustrating and even though we came last in the race because of that, all in all it’s better than writing off two boats and not being able to compete this weekend when it really matters. It’s a practice day, it’s done and now we’re ready to roll tomorrow. 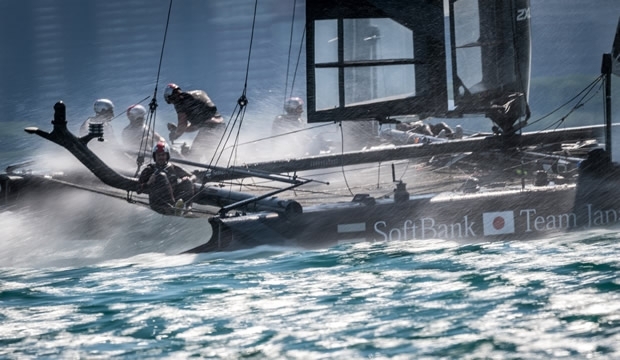 If one team stood out in the practice races it was SoftBank Team Japan, who won every race they started – three fleet races and a match race over Artemis Racing. Tactician Chris Draper is hoping their form will hold into the weekend. Chris Draper, Softbank Team Japan Tactician: “We are really pleased with how it went today. The results are good, the team sailed really well and we’ve made a pretty significant change to the way we’re sailing upwind, and that looks to have been really promising. If we can keep that moving forwards and keep building on everything we’ve been working on for the last three or four months, that will be great. You don’t get many chances to practice and obviously the boats we practice in all the time, away from races, are very different, so today has been very valuable. Chicago fans turned out in force on a beautiful Friday afternoon, lining the promenade at Navy Pier. Boats were launched at 6:00am ahead of the first race at 1:30pm. As early morning clouds gave way to sunshine, the wind filled in just ahead of start time, resulting in near perfect racing conditions. Winds were 12 to 15 knots, with some stronger gusts up to 20 knots, creating challenging conditions for all the teams. As per instructions from the Commercial Commissioner, the last race of the day was designated a ‘substitute race’. It will only be scored as an official race if conditions do not allow for a full schedule of racing over the weekend and it is inserted into the international broadcast. Racing on Saturday is scheduled to start at 1:30pm local time with three fleet races on the docket.